Hungarian philologist and historian; born in Ukk, a village in the county of Szala, Hungary, Feb. 18, 1866. At the age of eleven he was sent for two years to the Talmud school of the Lo Alman Yisrael society at Jánosháza, and he studied subsequently for more than three years at the Talmud school of Dr. Solomon Breuer, at the time rabbi at Papa. He then taught for a time in small villages, entered the rabbinical seminary at Budapest in 1884 (graduated 1889), took the theological course in that institution, and attended lectures at the same time at the University of Budapest. 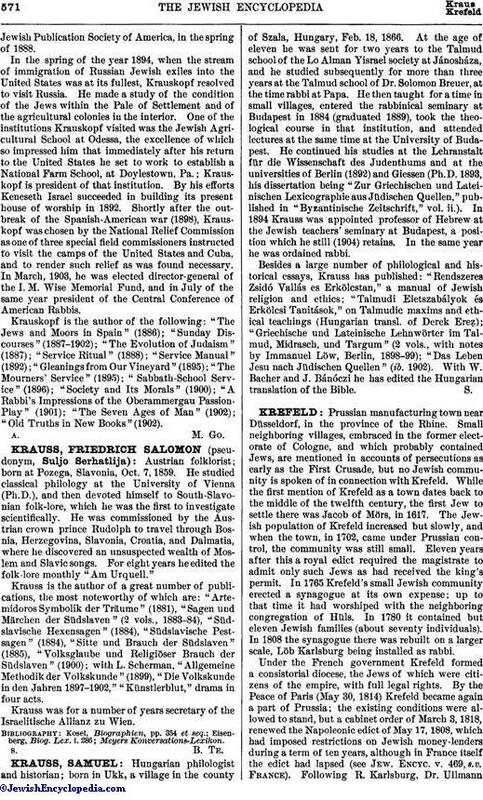 He continued his studies at the Lehranstalt für die Wissenschaft des Judenthums and at the universities of Berlin (1892) and Giessen (Ph.D. 1893, his dissertation being "Zur Griechischen und Lateinischen Lexicographie aus Jüdischen Quellen," published in "Byzantinische Zeitschrift," vol. ii.). In 1894 Krauss was appointed professor of Hebrew at the Jewish teachers' seminary at Budapest, a position which he still (1904) retains. In the same year he was ordained rabbi. Besides a large number of philological and historical essays, Krauss has published: "Rendszeres Zsidó Vallás es Erkölcstan," a manual of Jewish religion and ethics; "Talmudi Eletszabályok és Erkölcsi Tanitások," on Talmudic maxims and ethical teachings (Hungarian transl. of Derek Ereẓ); "Griechische und Lateinische Lehnwörter im Talmud, Midrasch, und Targum" (2 vols., with notes by Immanuel Löw, Berlin, 1898-99); "Das Leben Jesu nach Jüdischen Quellen" (ib. 1902). With W. Bacher and J. Bánóczi he has edited the Hungarian translation of the Bible.